Stocks started off with a bang on Monday morning. However, the morning gap up quickly faded, with the S&P 500 slowly chopping higher in the afternoon. After big gains last week, bulls are showing some hesitancy ahead of the Federal Reserve’s announcement later this week. Let’s get a look at what’s moving the market in this week’s early top stocks trades piece. We won’t put too much time on the financials like Bank of America (NYSE:BAC), JPMorgan (NYSE:JPM) and Goldman Sachs (NYSE:GS), but all are moving nicely on Monday. They are breaking out of the bases we highlighted last week and if they continue higher, it’s hard to be too bearish on the market. Shares of Tilray (NASDAQ:TLRY) will be in focus when the company reports earnings after the close on Monday. 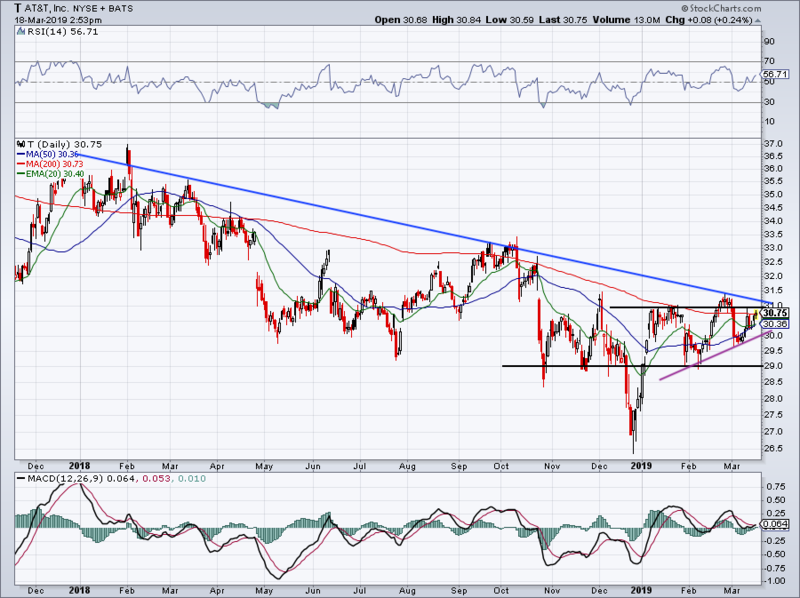 The stock has been stuck in quite the downtrend, although InvestorPlace readers did capture a nice breakout in January. Anyway, shares are now trending lower, sitting on a notable level of support near $70. With a 25% short-interest as of February 28, this one is sure to be a big mover. The question is, will we see a breakdown or a breakout in TLRY? I don’t like guessing ahead of time and would prefer to react to the move instead. A break below $65 would send Tilray to levels it hasn’t seen since August while a breakout over $78 could catapult the stock up to $100. 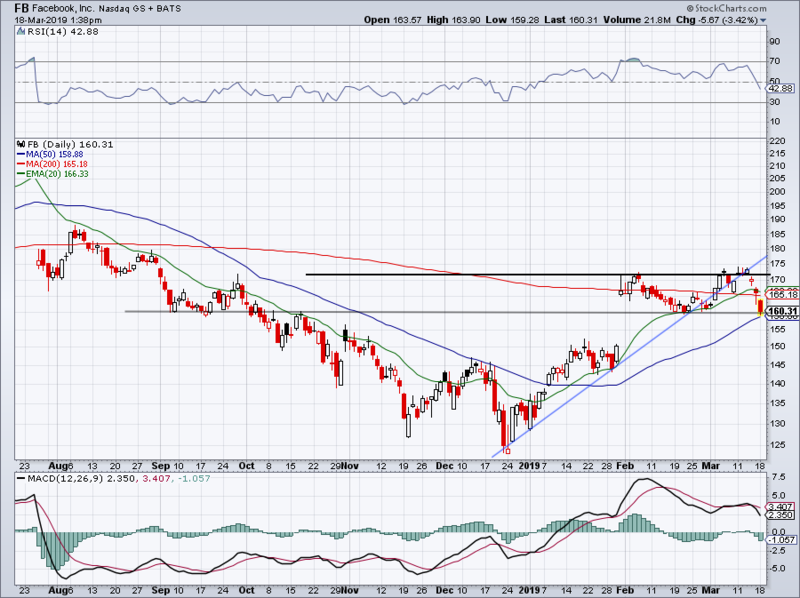 While Amazon (NASDAQ:AMZN) is breaking out in unsurprising fashion, Facebook (NASDAQ:FB) has been pulling back. Shares are down $15 or 8.5% in hurry, as they now rest on the 50-day moving average. For bulls who believe in more upside, this gives them a low-risk long entry. There’s no reason to overthink this one. 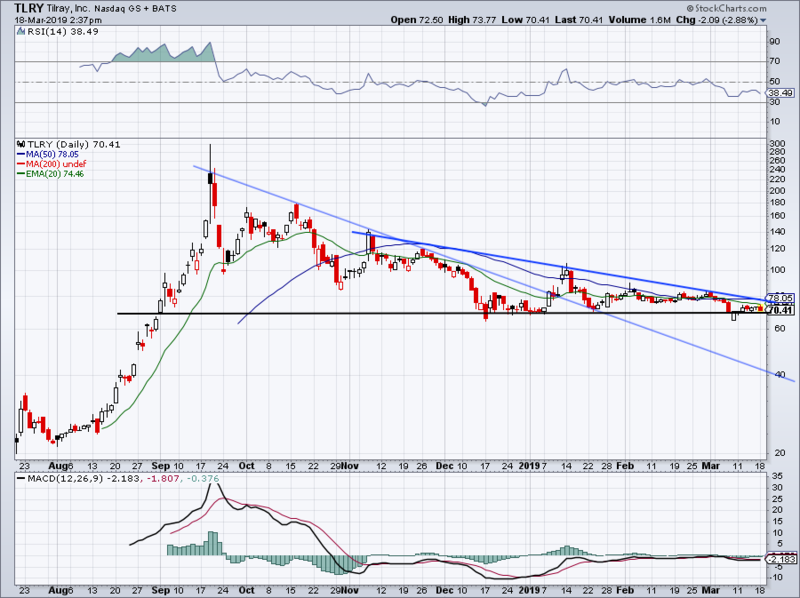 I don’t personally like this stock too much, as its volatility is simply way too high for me. However, a number of other investors like Overstock (NASDAQ:OSTK) both from the long side and the short side. Although down 4.5% on Monday following less-than-inspiring earnings, bulls have done a good job salvaging this one. To stay long, they need OSTK to maintain the 50-day. Below it and $18 becomes the “must hold” level. So far, the 20-day moving average is acting as resistance. Below Monday’s lows and OSTK is in trouble. Over $22 and OSTK can see the 200-day. Ouch. that’s the only word that comes to mind with Synaptics (NASDAQ:SYNA), down 22% and hitting new 52-week lows. 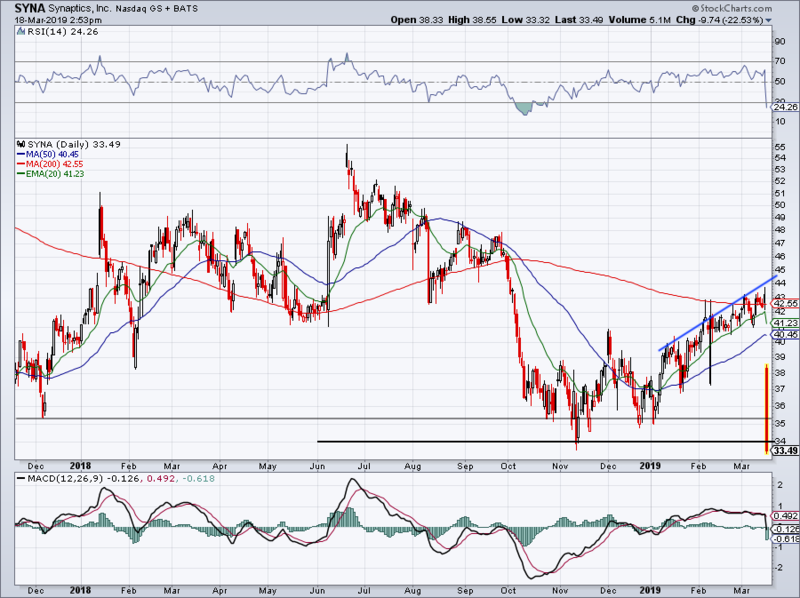 The stock blew through vital support near $35 and failed to hold its November lows near $34. Unless this one’s back over $35, it’s a no-touch for me. Let’s give it a few days to play out before considering it. AT&T (NYSE:T) is one we’ve highlighted a few times thanks to its attractive and sustainable dividend yield. The name has been more volatile than usual over the past few months but is trying to get some traction to the upside. 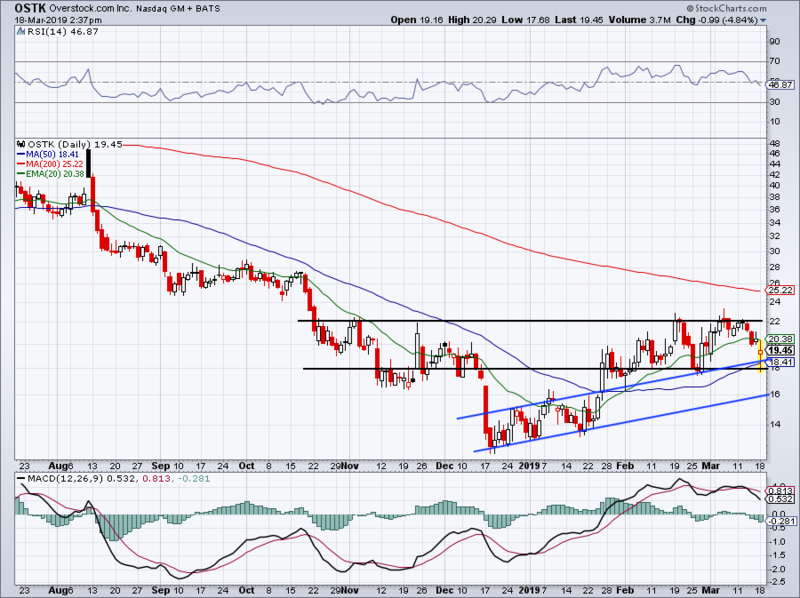 Shares are now over all three major moving averages, and if it can push through $31, T could trigger a larger breakout. Even a bounce into the low-$30s would represent an attractive return when coupled with the still-elevated 6.65% dividend yield. Below $30 and the bulls lose some luster, technically speaking. But fundamental and income investors would love to scoop this name up at $29. Bret Kenwell is the manager and author of Future Blue Chips and is on Twitter @BretKenwell. As of this writing, Bret Kenwell is long T and BAC. The post 5 Top Stock Trades for Tuesday: Facebook, Tilray, Overstock appeared first on InvestorPlace.